I believe word play is incredibly important for kids. We help our kids get a great start on their future education if we include them in rhyming, chanting and playing with words. One fantastic way to do this is to make sure kids listen to, read, and write poetry. I am here to say that poets like Lorraine Marwood elevate word play to an art form! Guinea Pig Town and Other Animal Poems was written by Lorraine Marwood and published by Walker Books Australia (2013). Squawk! Snuffle! Bark! Roar! Feathers, fins, scales, claws. Running, hopping, crawling, soaring. All creatures are celebrated in this new collection of poetry by Lorraine Marwood. In this collection of verse for kids, I love that the poems reach out to us, let us share snippets of Marwood's days. We see the "echidna, with quills prickle-flowering", hear the "gumnut bullets" of roof-rattling possums, share the delight of a whole town full of guinea pig babies, and mourn the broken wild thing, the "beaded red-ruffled, shivery, wild, wild thing" because Marwood uses words as precisely as a sculptor to pull us into the experience. The addition of well-chosen black and white sketches doesn't detract from our focus on simply enjoying the poetry. This isn't a book to be read from cover-to-cover. I'd encourage kids to dip into it and savour its delights. If you're looking for ways to introduce more poetry to your children's lives, it would make an excellent choice. You could find a poem and follow it up with an experience in the real world to match. Or if you see a duck at the park, come home and share the poem about ducks. It matters not what comes first, the poem or its real-life parallel, so long as kids get to share the joy of vivid imagination-encouraging, picture-creating, well-chosen words. Schools are always looking for poetry books that are accessible to kids. 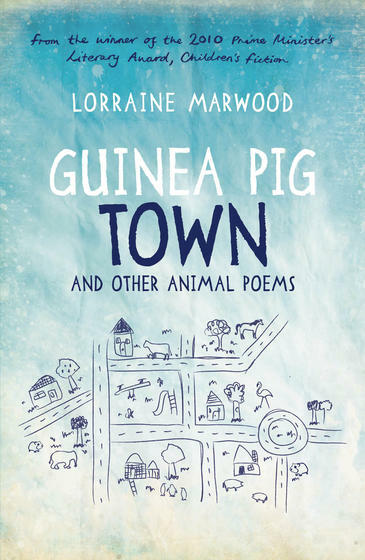 In Guinea Pig Town, Marwood has struck just the right balance of literary merit and fun, of finely-tuned phrases and language that engages kids in a conversation. Walker have added extra value to an already valuable addition for your home or school library with excellent Teacher notes. Looks fun! I'm always looking for fun poetry beyond Shel Silverstein! You are right. It is so difficult to find good poetry books for children. These topics sound appealing, and I like your suggestion to tie reading them in conjunction with the child's experiences. Teachers could do the same with topics being explored in the classroom. I agree, Barbara, it would be great if teachers tied poetry in to classroom topics and themes!